This is not the first time that Matthew Waterhouse has reprised his role as Adric in a full-cast audio drama (that occasion was the award-winning Fifth Doctor Box Set in 2014), but it is his first appearance in the monthly main range. It has to be said that among the regular cast (the full Season 19 complement including Peter Davison, Sarah Sutton and Janet Fielding), Waterhouse has the hardest time recapturing his early 1980s voice. In fact, it sounds as though Adric has a cold (which should, of course, clear up immediately in a rapidly healing Alzarian), and the beleaguered guest character Nomar (Kris Dyer) sounds more like the youthful maths genius at times, which leads to some confusion. Smith has written a story that fits in well within the era he is evoking. 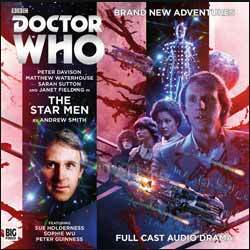 Featuring a gateway to another universe and lots of real science (including the Large Magellanic Cloud, a dwarf galaxy in orbit around our own Milky Way; the Tarantula Nebula within it; and star formation), The Star Men could have been commissioned by the early ’80s script editor Christopher H Bidmead. Steve Foxon’s incidental music is mostly modern, but with a few affecting moments in which he recalls the themes of Paddy Kingsland. It did strike me as strange to hear beings from outside our galaxy uttering colloquial phrases such as “do your worst”, “it breaks my heart” and “bled it dry”. And there is some rather, um, over-earnest acting from the likes of Damian Lynch as the gung-ho General Fell and Sue Holderness as the solemn Controller Tace. But they are reading from a script that recaptures the slight staginess of Who of that time, and there are some moving performances towards the end. At the end of the day, Season 19 is one of my favourite periods of classic Who, so it was almost inevitable that I was going to love this.